For over twenty years, Golden Farm Products has been growing spray millet for the most demanding exotic bird owners. We have developed and are continually improving our own varieties of seed based on our customers' feedback. Our spray millet's quality is a combination of unique geography and the extensive experience of the producer, much like a premium wine from the Napa Valley. We grow our California Spray Millet in the fertile soil just north of the Sacramento River Delta. 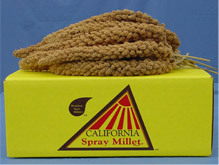 The unique combination of warm, cloudless days and nights cooled by the delta breeze produces the highest quality spray millet available anywhere. Here at Golden Farm Products, we take the responsibility of feeding our customers’ exotic birds with pride and determination. We harvest the crop every year by hand with the utmost care taken to preserve the integrity of the seed heads. It is then sorted again by knowing hands to ensure that only the highest quality spray millet gets packed into the trademarked yellow boxes bearing the Golden Farm Products logo. Finally, the spray millet is stored under very specific temperature and humidity to guarantee that the integrity of the product is maintained over the course of the year. We hope you enjoy our millet!